My weekend was packed, with packing. And rearranging. And organizing. And de-cluttering. And laundry. And loading my car with tons of stuff I don't want or need anymore. I finally did it. I finally did all the organizing I have been talking about for the last few months (I work way better under pressure). Funny, it was all so much worse in my mind, but it usually is, eh? I definitely superseded my 40 bags in 40 days goal. I got rid of at least that in under 40 hours. Is it weird that it was one of the best weekends of my life? I tell you one thing about having kids, they come with stuff and they grow out of stuff and they become disinterested in stuff and no matter how much stuff they have you want to buy them more stuff and everyone you know wants to buy them stuff. So when I added my little M+L almost 5 years ago (!) I had also been adding 5 years worth of "stuff" on top of my 30 years worth of stuff and Fisher's 10 years of stuff. It wasn't pretty friends. But now the whole world feels prettier with a packed mini-van and a half of stuff out of my house. This weekend I also thought a lot about fonts. 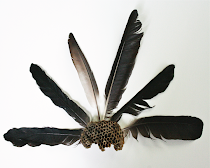 Durning my breaks over the weekend I spent time trying to redesign my Plumed logo. I don't hate what I have but I don't love it either and I think a logo is something you should love. I have also tweaked my current logo so many times I have a-little-bit different logo on everything: my business cards, my etsy shop page, facebook, labels. It's not good. 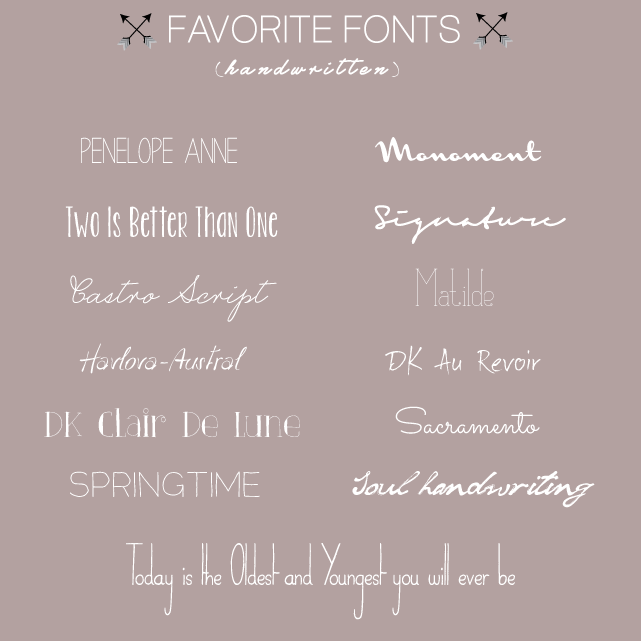 I haven't finalized anything yet but I find I do gravitate towards handwritten fonts and I have pulled together a few of my favorites. Right now I am leaning towards monoment. I am so indecisive! I wish I could throw thousands of dollars at someone to do it for me but if I had thousands of dollars laying around I think I'd rather throw it around Europe for awhile and still do my own logo. Maybe if I come down to a few finished logos that I can't decide between I will put it up here for a vote . . .
My weekend was full of de-cluttering too, and it does feel SO GOOD! But i have a long way to go if i ever want to kep up with the Swedes! PS There is a fantastic font shop in Denmark which sells nothing but hundreds of unique fonts, it's fab! You can even buy someone a font for their birthday! oh! that place sounds like so much fun!! i want a font for my birthday :) i have a long way to go too, but i feel like i can finally see the light at the end of the tunnel and that's a huge step. and i have a very, very long way to go if i ever want to move to sweden!! Most of my weekend was spent getting the chair cover for my next chair cut and sewn and on Sunday I needed a lazy day on the couch. Thanks for the font round up! I am always looking for new fonts. Have a great week Christine! Madre qué chulada!!! Con lo que me gustan las tipografías, gracias. I love Sacramento. Handwritten, yes, but still clean and professional. that's one of my contenders for sure. i really like as wel, for the reasons you mentioned. I think Monoment, Signature and Castro Script are my favourites. Hope your week is off to a great start, Christine! OMG. I have so much organizing to do before Baby 2 gets here. And I feel like I'm on this time crunch. Haha! Definitely need to go through Mila's old clothes and toys. Sigh... And we're redesigning our logo as well...love some of these fonts! eek, well, hopefully your "nesting" will kick in and you will just knock it all out. i wish i had a little of that feeling some times, it can really get you moving to get things done. ooh, can't wait to see your logo, though i do love what you have now. but change is good! The "getting rid of STUFF" feeling is the absolute best, isn't it? I'm getting to the point where we need to do some of that. We have bags packed and sitting in our closet, waiting to go, but they've been there so long that now we have even more. I know I'll feel better when we just DO IT, but I'm getting antsy thinking about how much stuff we have. STUFF. Everywhere! Ack! half of the bags had been bagged and ready to go for months! it was driving me crazy because i got to a point where i couldn't do anything else until i removed the bags and bags. so i bagged some more and put them everywhere (they wouldn't fit in anymore closets) and thus was forced to get them out. now i just want to have a final "walk-through" of sorts, get rid of the last unwanted items and i will have my closets back! i have changed my logo so many times it's crazy. i just need something i can live with for awhile/forever (?) and be done with it already. why is it so hard?! I love that "Springtime" font! It reminds me of "Frenchy", which is what I use on my blog sometimes. Great picks! Fonts are so much fun to play with. We also did a bit of a purge of misc items over the weekend, I feel so much better for it. Good luck with the logo re-design - I am loving the Matilde font right now! Oh my goodness, I completely understand your "stuff" conundrum. I have been purging little by little and now a big pile sits in the garage waiting for me transport it to its new home (aka Salvation Army). Good for you for tackling Operation Organization. I bet it feels so good. Thanks for sharing these pretty fonts. I'm always on the look out. I really like Monument for your logo. I also like Penelope Anne for you. Oh, and Sacramento is nice...Not for your logo, but in general. I love decluttering! My goal in life is to become a minimalist but I think that is next to impossible. I love the Matilde fonts. Good luck on your new logo! I have such a logo problem too, I feel like I change it every couple of weeks. But there are just so many amazing fonts out there, plus you can make your own so easily that I just want to use all the fonts.